Anyone who suffers from asthma, allergies and/or acid reflux knows the problems associated with just a momentary relapse of symptoms. The pain. . . suffering. . . constant dread . . . not knowing what is wrong . . . what to do! And anyone who is confused about why they get no relief from treating just one of these problems may just find the answers today! It has been observed by many asthma specialists that asthmatics are also more likely to have a defective lower esophageal sphincter (a common problem associated with acid reflux). Moreover, many reports have revealed that asthmatics who received treatment for acid reflux also experienced noticeable relief from the symptoms of asthma. First, acid reflux may cause people to breathe little droplets of acid into their lungs without them knowing it. This acid can aggravate the fragile pulmonary lining and cause spasms in the airways, which in turn can result in an asthma attack. Second, recurring episodes of acid reflux may cause digestive acid to melt away the esophageal lining and expose some parts of significant nerves that are connected to the lungs. The irritation of the nerve endings have been observed to also set off the constriction of airways, which could then result in an asthma attack. Asthmatics may know that their asthma attacks are connected with acid reflux if their asthma began after reaching adulthood. Acid reflux is also suspected if asthma symptoms become more evident after eating, at night, or after lying down for a while. It can also be evident if the typical asthma treatments don’t work. With the link between asthma and acid reflux being recognized, it is therefore prudent to test for GERDs disease. The combination of these two diseases can seriously hamper the quality of one’s lifestyle and therefore early detection and treatment is warranted. Take proper care of yourself, your body and your health. How? By providing your body with the necessary resources to fight back against? your? acid reflux and asthma. You can find out how to reduce acid reflux symptoms with the Reflux Remedy Report! This is one simple way to end your suffering from acid reflux, GERD, LES, and heartburn! Many of the problems associated with allergies and acid reflux can be effectively treated with holistic treatments. And without many of the dangerous side effects associated with some prescription drugs. If you take allergy / asthma medications you may have heard about this in the news, but it deserves mentioning again. If you have not read this article, please take the time and read it! You owe it to yourself to take a look at using all natural and holistic remedies. You will not only learn a lot about natural and alternative treatments for allergies, asthma and acid reflux, but you will empower yourself and your body to fight for itself. Acid reflux sounds like a modest disorder, common, mild and treatable. However, it has become a burden to millions of people, affecting food choices, sleep patterns, moods and activities. In fact, acid reflux can be so debilitating that it is now being considered an epidemic, affecting millions of lives. Not only is acid reflux irritation unpleasant, but it is painful and can negatively effect daily life. 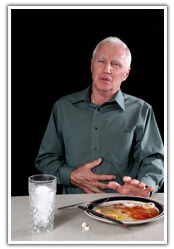 If acid reflux is left untreated or is improperly treated it will yield negative complications. It can potentially lead to GERDs Disease (Gastroesophageal Reflux Disease) and even lead to esophageal cancer. Traditional treatments, such as OTC drugs, are usually the first thing sufferers? reach for when symptoms begin. However, these types of treatments only mask the symptoms and do not address the reason behind acid reflux disease. OTC drugs are not only ineffective in the long run, but can lead to many dangerous complications. Antacids and proton pump inhibitors can block acid levels that are necessary for proper digestion and mineral absorptions. They also contain heavy metals that, over time, can increase the risk of liver, heart, kidney and bone disease. There is a debate among the medical community about the most effective treatment for acid reflux. Medications or natural treatments? While some OTC medication are effective for treating symptoms, there have been no long term studies that prove the effectiveness or saftey of these methods. On the other hand, it has been reported that 97% of heartburn and acid reflux symptoms can be treated with natural or alternative remedies. These remedies are in fact, highly effective and safe. Among the first steps to alternative treatment are lifestyle changes. These changes include self-restraint, diet changes, avoiding certain foods, weight management, and a general healthier lifestyle. It is imperative that proper natural treatment and education be a leading part of any acid reflux regime. Consult your doctor about alternative treatments for acid reflux and be sure to educate yourself. There is no single alternative remedy that will work for everyone with acid reflux, so be sure to try a few. Try ones that you are comfortable with, but be sure to try a few first before seeking medical treatments. In extreme cases surgery may be your only option. If you would like to learn more about Acid Reflux and alternative treatments, check out the Acid Reflux and Heartburn Remedy Report. A resource report where you can get information, tips, easy at home remedies and resources for treating acid reflux.